This might be a little confusing to you at first, but I am one of four breeds that are referred to as "Belgian Sheepdogs" or "Belgian Shepherd Dogs"
Two of the others are the Belgian Malinois and the Belgian Tervuren. The other one besides me is known simply as the Belgian Sheepdog (Shepherd) -- and it is sometimes called the Groenendael. 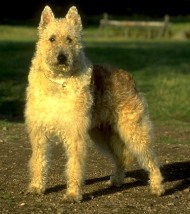 You might also see me referred to as the Belgian Laekenois. I told you that it would be confusing! We are all extremely talented at what we do and very similar in size. The main difference is in how we look and our availability. My coat is rough and wiry and comes in reddish-brown, gray, or fawn. It needs to be groomed and brushed to keep it looking presentable and I need lots of exercise in order to stay fit and healthy. I am known to be strong-willed and to have a �take charge� disposition, but if I am taught your rules and expectations at an early age, I can be a good companion. My guarding instincts tend to make me a bit wary of strangers. We have no Belgian Laeken Breeders listed at this time. Click here to place your Belgian Laeken Ad!